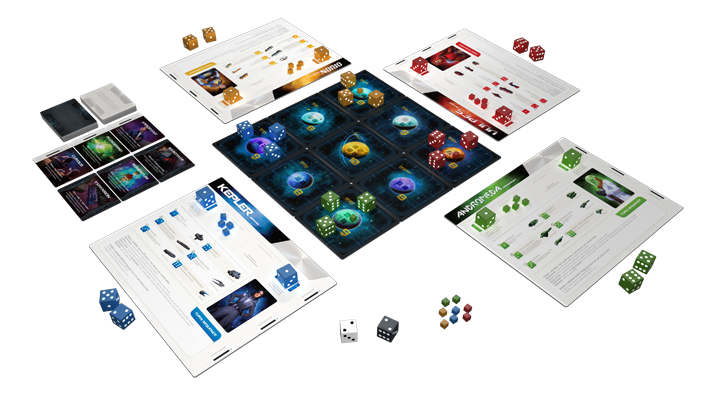 Quantum is a game full of colorful dice and cubes flying through space in epic battles to dominate any of the near planets. The game has very nice quality components (the first run of this game here in the states had some dice that were not that great and were oily/sticky - but Passport Game Studios replaced these with new top notch dice when they were able). The instruction book does a pretty good job with presenting the rules and providing illustrations and examples. There has been some rule changes that you may need to double check on Board Game Geek along with one specific card text that really should be changed. The player boards are a really nice reference and even though each board/player utilizes the same mechanics, the artwork for each board of the ships is different for each race. It would have been nice to see some special ability for each race, but I hear that may be in the works for a future expansion. The game is won by simply arranging your dice ship around a planet so that they total the number on the planet. Placing a Quantum Cube on a planet takes 2 of the 3 actions you have each turn. You can also place a cube if you win enough battles destroying your opponents ships. The game is that simple. Move the dice around and attack others who dare challenge you. The use of the dice number is pretty brilliant where the 1 represents the largest and slowest ship, but is the most powerful in battles down to the 6 which is a little scout that can move great distances but won't usually last against a 1. The number shown on the die is how many spaces that die can move and extra dice are rolled in battle and added to your ship number - the lowest winning. A fun game that has some good strategy but has plenty of luck with dice rolls makes for a fun colorful space game that feels different and refreshing and that is How Lou Sees It!